Naturally Curious, by Mary Holland, 2010. 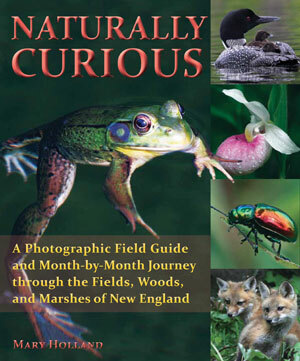 Illustrated with more than 900 color photos, this book is a vertiable encyclopedia of natural history in New Engalnd. The author guides you through the many natural happenings during each month of the year. It is part field guide, part nature narrative, and always wonderfully informative. It has received rave reviews from such prominent naturalists as Bill McKibben, Paul Rezendes, W.D. Wetherell and David Sibley. 496 pp., 7 1/2" x 9."